In 8th grade, my literature teacher, Mrs. Catovic, assigned us a short story to read over winter break – Flowers for Algernon. Written by Daniel Keyes, this is the tale of young Charlie Gordon, who was born mentally handicapped, and the attempt of a group of scientists to increase his IQ artificially. The narrative consists of a series of progress reports that he has been asked to write by the scientists, and due to Charlie’s mental handicap, are written in a very crude and sometimes humorous manner. As the book progresses, though, the quality of writing improves drastically, reflecting the change in his intelligence. I vividly recall the part of the story that struck me the most. During one of the later chapters, Charlie finds himself significantly more intelligent than when we first meet him, thanks to the experiment’s success. He goes out to dinner with one of his teachers – Ms. Kinian, whom he has taken a romantic interest in. Initially, Charlie is very well liked by his associates because he is hardworking and, due to his mental handicap, easy to make fun of. On several occasions in his progress reports, Charlie describes events that take place during work or when he hangs out with friends, and many of these involve others having a laugh at his expense, unbeknownst to Charlie. However, as time goes on, and his mental state begins to improve, these people start to avoid him. His newfound intellect makes him much smarter than his cohorts, and they in turn can no longer make jest of him. During this particular outing, one of the employees washing dishes accidentally spills a tub of crockery to the floor, and scrambles around attempting to right his blunder. His manager comes out in a fit of anger and reprimands the boy for his mistake, and as the tirade continues it becomes more and more obvious that the boy suffers from a mental handicap as well. The people in the restaurant, including Charlie, begin to laugh at the boy, who, sensing his audience, starts to make a spectacle of himself for more attention. The pivotal moment comes, though, when Charlie realizes that he himself is also laughing at someone who is, in a way, just like him, becoming upset with himself and getting up to defend the boy. This part in particular was very interesting to me because of Charlie’s realization that, while he had become more intelligent, he had also become exactly like the people he used to think were his friends from work. When the boy had started to make a fool of himself, he did not hesitate to join in the laughter. Laughter at something that he himself was only a few months ago. At the beginning of the book, the style of writing that of a person with a low IQ, and as a result, far less coherent in comparison to later entries, or even what a person of average intelligence might be capable of. I feel as though the writer used this as a way of showing his readers that the conflict Charlie faced was not something specific to him, because we, as readers, also inevitably laugh at his limited language skills – only to realise later how inhumane we are being. In a subtle and masterful way, Daniel Keyes awakened a deep sense of empathy within me. As I continued to read the book, I could feel other things about myself changing. In many ways I felt similar to Charlie, because by the end of the book, I too was much different from the person I was when beginning it. The amount of emotional growth I experienced while reading became the foundation that I built a great deal of my morality on. When I came to the end of the book, I cried. I had never done that before, and I had read some very sad stories just a few months ago. I think the reason it moved me so much was because it felt as though, by closing that book, I was burying an elder who had come and taught me so much I did not know about humanity and myself. It was at that point that I knew I wanted to become a writer. I have always felt as though art forms were one of the best sources of wisdom and guidance, because it is not always about what you are trying to convey – many a times it is about how the audience interprets it. You could show a group of people a portrait and every person in that group could derive a different meaning out of it, and all of them could be correct. It could be significant to all of them for different reasons, even in ways that the artist did not intend. In a lot of ways, artistry is a form of teaching people how to teach themselves, which is frankly the most effective way of teaching anything because it comes from within. When you read something and begin to consider what it makes you feel or think, you are willed to agree or disagree, and based on that opinion, you can craft a moral value within yourself. This is a more effective form of teaching because as human beings we tend to be more defensive when someone shows us our wrongs; however, when we evaluate ourselves we are more prone to taking heed to that form of admonishment. When I read Flowers for Algernon, it changed my outlook on life for the better. It made me question my own humaneness, and I hope that with my writing, I can have the same effect on others. If I can carry that torch for anyone at all, and open their eyes to things that will improve them as people, that is the way that I can change the world. 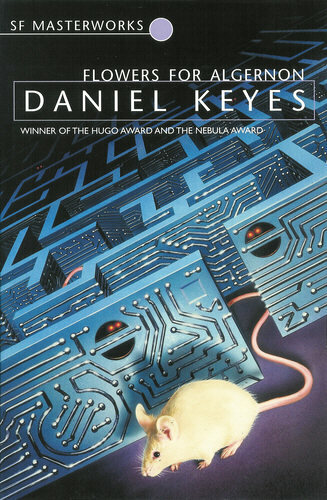 Tags: Daniel Keyes, Flowers for Algernon, good reads, reading. Bookmark the permalink.